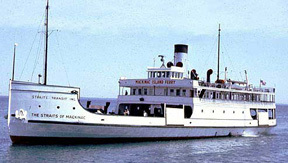 The Straits of Mackinac served faithfully as a car and passenger ferry for a number of years before they built a bridge of over the passage. Reminiscent of a time when motor travel was still a novelty, many a family has fond memories of riding the 204 foot long, coal fired ferry across the straits. Of course the Straits of Mackinac now serves the Great Lakes once again, this time as an amazing attraction for divers. Sunk intentionally in 2003, divers have enjoyed exploring her at the bottom of the lake for what will be the 16th dive season. With the sand at 82 feet and the mast towering up to 45 feet in depth, the “Mack” is a great wreck for the intermediate diver to further hone their skills on. We visit the Straits of Mackinac from Hammond Marina.